After establishing a promising clientele from around the globe in last 15 years, we are very excited continuing our footprints in the Middle-East region by exhibiting at COMEX once again. 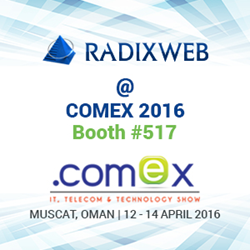 Radixweb, the industry leading Enterprise Software Development and IT Outsourcing Company, announced to showcase its rich technology competencies and domain expertise at the Oman’s Leading Technology Exhibition, COMEX 2016, Booth #517 from April 12-14 2016. The company also announced to deliver personalized consultation by its team on Industry’s top trends to booth attendees like MS Dynamic CRM, Enterprise Mobility, Application Modernization and more. COMEX Oman 2016 visitors can book an appointment now. COMEX is Oman’s premier ICT event, and unique platform to experience the latest innovation, trends and technology. It brings an opportunity for organizations from across the globe to connect and make a better decision on IT investments. “After establishing a promising clientele from around the globe in last 15 years, we are very excited continuing our footprints in the Middle-East region by exhibiting at COMEX once again,” said Pratik Mistry, Sr. Business Head, Radixweb. “This year we look forward to showcasing our technology competencies and passion for IT, which offers extraordinary opportunities to improve value for businesses worldwide. We constantly work towards increasing our efficiency & boosting competitiveness so that we can embrace latest technology innovation and help companies to enrich processes. Radixweb will be representing its IT services and domain expertise which are in-line with latest technology trends,” Pratik said. Radixweb will also be sharing live updates from the conference on its Twitter feeds @Radixweb Follow the conversation using #RadixatCOMEX.